Well, we had a pretty busy weekend with me ending up sick! UGH! Saturday, we went to Disneyland as planned. It had got to be the best buy we've ever had on any Disneyland deals. They were having a special promo for all Southland (So.Cal.) fire and rescue personnel. And since DH works in the E.R., he qualified for the special price. He just had to show his work ID and we got to buy tickets at the (very) discounted price. The price we paid for a 3-day park hopper ticket was even less than the regular amount for a 1-day, 1-park admission ticket. Yes, it was an awesome deal. The day was nice and cloudy. We were there bright and early, at about 9 am. Some drizzling here and there occurred throughout the day but it wasn't much of a downpour to drive us home. There were many "firsts" for this trip. Since DD3 is 1 year old now, she is not able to ride with us in select rides that do not have height requirements. So, for the first time, the whole family got to ride "Autopia," "Buzz Lightyear" and even "Pirates of the Carribean." It was really a lot of fun to go on the rides as a family! 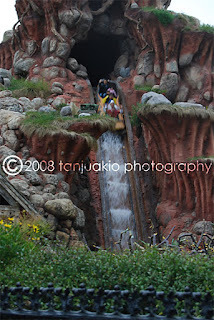 During this trip also, DS and DD1 rode Splash Mountain with DH! And they loved it! When they were in line, I was a little anxious for DD1. But after the ride, all 3 were sooo excited. DD1 just did not like that her jeans got wet! LOL! That's them in the picture. They're at the back of the log. DH is in black, that's tiny DD1 in pink. You can hardly see DS but he's the one behind the yellow poncho. DS also rode the Tower of Terror over at California Adventure. OMG! I do not even want to ride that. It's a freefall kind of ride. It was the last ride of the night and what a way to end our day. DS was visibly shaken but was putting on a brave front. You could see that DH was so proud of his son though. He had found his riding buddy! LOL! They cancelled the electric light parade because the paths were wet because of the rain. So, we went home earlier than normal.